The Clarkson University women's hockey team grew from a David into a Goliath seemingly overnight. The Golden Knights, who call the 4,300-student university in Upstate New York home, have proved that a small school can do really big things. They've won three NCAA championships since 2014, and are gearing up to make a run for a third straight at the Women's Frozen Four in Hamden, Conn., in late March. This current Clarkson team could be the best one yet with 10 players returning from the two-time defending champions. Clarkson has shown it belongs in the same conversation as the three bigger schools that have dominated Division I since the NCAA introduced the sport in 2001: University of Minnesota, University of Wisconsin and University of Minnesota Duluth. 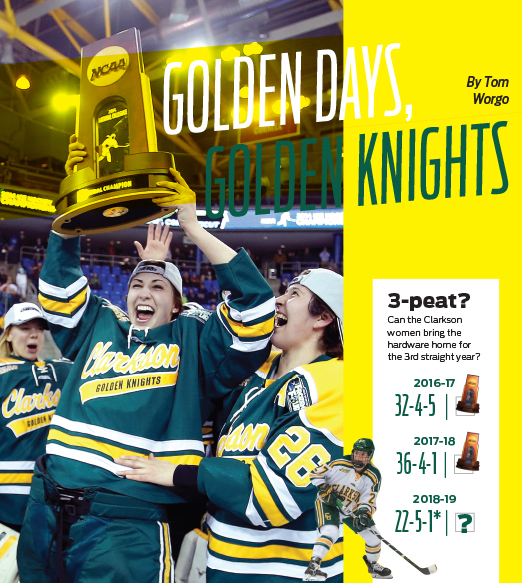 The Golden Knights are driven to become only the second program besides Minnesota-Duluth (2001-2003) to win three straight in the 18-year history of women's college hockey. Who would have ever thought Potsdam, N.Y., would be called a hockey hotbed? "I think our program has done a pretty good job of creating that legacy so far," said Clarkson head coach Matt Desrosiers. "We were the first eastern team to win a national championship. Our players, past and present, have put Clarkson hockey on the map. Clarkson wasn't a big household name." It was actually the Desrosiers' household that helped the Golden Knights gain notoriety. Desrosiers' wife Shannon served as assistant coach for five years before she became co-coach with her husband in 2008. Matt took over by himself four years ago when the couple had their second child. Things have clearly changed since Matt Desrosiers guided the Golden Knights to their first title. Now, more teams have a shot at being on top. "There's a lot more parity," said Clarkson assistant coach Britni Smith. "To put yourself in a position to be fighting for a national championship, let alone winning one, is something that is becoming harder to do. That's for sure." Clarkson often deals with adversity. The Golden Knights surprisingly lost games this season to Colgate, Yale and Cornell during a five-game stretch around Thanksgiving. Then they snapped back to focus sharply, and are playing like an elite team again. "The three years we won a national championship, every year there has been a point in the season where there has been a wake-up call," Desrosiers said. What helped Clarkson get out of its mini-slump was its dominant top line of senior Loren Gabel, junior Michaela Pejzlova and sophomore Elizabeth Giguere. It's likely the best forward line in the program's history with each of the three ranking among the nation's scoring leaders. Gabel, a native of Kitchener, Ontario, is one of the top candidates for the Patty Kazmaier Award, which is given to the top women's college hockey player. "She is an electrifying player," Desrosiers said. "She is extremely fast and has a really, really good shot." That line gives the Golden Knights more cushion in games than in past seasons. "It's nice to be able to win games by two goals (or more) that we might have only been winning by one in the past," Smith said. Those elite players are supported by a solid nucleus of Americans who provide grit, leadership, energy and a defensive mentality. "When we build our team, we are not looking for the most talented kid that can score all the points," Desrosiers said. "We have done a great job of finding the right pieces and understanding you need different players with different roles to get the job done. That's what I have found in our American players." T. T. Cianfarano has been as valuable as any of the Americans on the roster. One of two graduate students on the roster, the Oswego, N.Y., native walked into the Golden Knights locker room with a healthy dose of street cred after transferring from Quinnipiac University after graduating in 2018. Cianfarano earned ECAC Player of the Year honors after a 52-point sophomore season, and finished her Quinnipiac career with 110 points in 111 games. "She was a nice pick up," Smith said of the second-line winger working on her MBA. "She is able to produce offensively, which allows us to not have to rely on the top line to score every game. She fit in right way. Her transition was seamless." Junior Taylor Turnquist, a native Minnesotan, gets just as much praise from the coaching staff as Cianfarano. "We had her at forward and she is now playing defense," Desrosiers said. "She has been valuable to the success of our program. She is someone we put a lot on as far as being a leader." The contributions of two American underclassmen can't be overlooked, either. Sophomore Tia Stoddard, a native of Southern California who played her youth hockey for the Anaheim Lady Ducks, and another Minnesotan, freshman Morgan Helgeson, both play on the third line. "She came in last year and was learning the ropes and our system," Desrosiers said of Stoddard. "This year, she has been able to elevate her game and become a consistent center for us. It's something we really needed." The Golden Knights understand if they want to be considered a dynasty, the players must lean on each other. "Those losses hit you harder in the stomach because there are such higher expectations for Clarkson hockey," Cianfarano said. "I knew I had to come ready to work each and every day to make myself better, and also my teammates better." Tom Worgo is a freelance writer based in Annapolis, Md.